Tuesday I spent the day continuing to clean. At least, I think that's what I did. I honestly can't remember, and I just checked with Michael and he has no recollection, either. Perhaps the reason for our lapse in memory will become apparent in a little bit. Tuesday night I played some more Ark. 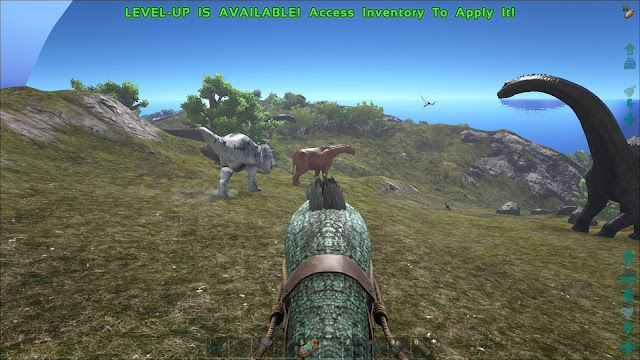 While I was playing, I tamed a Paraceratherium (the peachy looking 4-legged giraffe/bronto thing in the center of the screenshot above) and decided I wanted to name it the same as the Paracer I had tamed several months ago when I still played with Mom and Dad. I could not remember the name, however, and Mom and I had been messaging, so I asked her. We eventually figured it out, and Mom got excited and asked if we could play together. I do not want to play on official servers again. The game, when in its 'vanilla' settings with no modifiers, is very grindy and becomes a full time job just to maintain any progress you've made. Let's put it this way: from June 2nd, 2015 - October 29th, 2015, with a month break in September (Dad and I got bit by the WoW bug), I logged over 1600 hours in the game. Don't get me wrong, I loved (almost) every minute of those hours and still play the game. I just find myself unwilling to give up the life I have outside of video games to play a game I've already played a lot of. Anyways, after some back and forth, I told Mom that if she really was going to play consistently I would be willing to pay for and maintain a server. This seemed like the best course of action given our time zone differences and my own inability to host a server from our Korean ISP because of language/know-how barriers. Give me a regular modem (preferably Netgear, but I can work with most modems found in an American household), a spare computer, and a system that's in English or can be switched to English and I could have done this no problem. I've done it before, for all sorts of games from UO and WoW to Minecraft and Ark. It took me all of 5 minutes to get my server ordered, after I informed Michael what I was doing. While I set up the server configuration and installed the mods, Mom told Dad about our plans and Dad decided he would play as well. Michael also expressed interest. By the time the server was ready, it was almost midnight. We all hopped on and... well, played. It was fun seeing Mom and Dad relearn the game while discovering the new dinos from the base game as well as some dinos from a couple of mods I had installed. Michael and I had less issues as I still play and Michael still watches some Ark videos on YouTube. We played until almost 8 AM. This was no big deal for Michael, who is still on night shift. I don't know where my energy for the night came from. One minute it was 12, the next it was 4 am. After that I didn't look at the clock until I noticed that it was getting light outside. Wednesday was another day of video games, once I finally woke up. Mom and Dad were still asleep back home, but Michael and I played quite a bit and had tamed a few wyverns (which are nothing like UO's wyverns - think dragons!) by the time they woke up. That night I only stayed on until about 1 am, because of some plans I made with K.
Thursday I spent most of the day at K's house. We worked on some more Hanji crafts and also chitchatted. We hadn't ever talked one-on-one before, besides a several hour video call, so it was nice to get to foster a friendship that we suspected would flourish if given the chance. We both let off some steam and laughed at our very sarcastic personalities that seemed to mesh really well. By the time I left we were both very excitedly talking about another plan to get together and hang out. Eventually we'll go somewhere together, whether it's just her and I or a couples' getaway. Friday will be a complete surprise, you guys. We played more video games. Shh, nobody needs to know. We did get off at about 4, or 2 AM back home, because we wanted to nap before Michael and I joined C at the Dongdaemun Night Market. Are you ready for non-boring non-gaming related stuff? So am I, let's get to it! C picked us up shortly after 6, and it took about an hour to drive to Dongdaemun. For ease of travel and keeping Michael's curfew in mind, we parked under one of the malls in the district. Since we got in so early, we had to wait for the night market to open. We walked around and C showed us some of the other buildings that had malls with regular hours. Michael was very bored while C and I stopped to get some coffee and honeyed bread. Both were del-i-cious! My funky capris I picked up at Anguk station for W3,900 last week. I want more. These are comfy! The honeyed bread C and I shared. That was delicious, too. Once we finished eating, we started walking towards where the night market is set up every night. While walking around we checked out some of the street vendors that are usually out. Michael picked up some large Yakimandu, 4 for W3,000. They tasted pretty standard for mandu. I had a bite. It was delicious. Throwing your trash/recycle away is rather hard in Korea. There aren't public trash cans, and restaurants aren't all that friendly if you use their trash & recycle bins. What we had to do was look for the trash and recycle bags other people had left out on the street for collections and add our stuff to the appropriate containers. The beginnings of the night market! Once it was fully set up, there were yellow tents lining the sidewalk for an entire city block. While waiting for the rest of the tents to open up, we stopped at a food tent and bought some chicken & sushi on a stick. Sushi on a stick, with barbecue sauce and mayo. Michael says it was good, but I didn't want to try it. The texture would have made me gag. Too gummy. Chicken on a stick! I had a bite or two of this one as well, but my stomach was still bugging me from my earlier carsickness. It pestered me for an hour after we ate before I could finally shake it off. Once we finished eating, the stalls were finally open! I couldn't get a better picture of this, but this was a booth with shirts that lit up and reacted to music (vibrations). It was really cool. C got two shirts to bring home to the States, and I forgot to ask the vendor what music he was playing. It was nice a techno/dubstep mix that showcased each shirts' light-up prowess, but more importantly, I liked it. Sigh. Very dark picture, sorry! We found a dog café! We were excited initially... but by the time we left we were more sad than anything. The way a dog café works is you bring in dogs if they need to be babysat and pay for babysitting services. If you just want to play with some pups, the 'fee' is to buy a drink or snack from the first floor before going upstairs to play with the pups. The text on the wall upstairs. The upstairs setup. The first thing we noticed was the smell. That didn't bother us so much - it simply smelled of dogs, dog food, and a little bit of wet dog. Once we got upstairs, we saw that some of the dogs had defecated in their crates and nobody had cleaned it up, even though an employee was up there watching them. She was obviously a mother. We think the other two bulldogs that weren't in crates were her mate and pup. While we were there one of the bulldogs puked. The dogs that were in their crate weren't allowed out, which we could understand, but they were whining and begging for attention, which we gladly gave. The AC wasn't on upstairs, and it felt very hot. We felt awful for the dogs, and after watching an employee ignore the dog licking up its own throw up we decided it was time to leave. So, probably not the best experience for our first time being in a dog café. I know it's tainted how we view these types of establishments. Not that it seems appropriate after what I just talked about, but this was the slushee Michael got. Very berry. It was quite delicious. We left the café and finished checking out the tents. Nothing caught our eyes, so we decided to check out the mall buildings. Before we went inside a building, however, C demanded that we look at a field of lights that is a popular attraction in Dongdaemun. Each building has a plethora of stores. We checked out every. Single. Building. A funky shaped building we walked under while heading towards the field of lights. All of these roses were fake, of course, but they just look so pretty! The walkway on every side of these fields were crowded with people & their cameras. I'm very glad that Korean culture is very big on pictures. It makes me feel less out of place walking around and taking pictures. Michael was so excited he had to express himself by going to Facebook. LOL No, his phone went off and he had to check it in case it was work contacting him. The picture above was our view from the top of one of the buildings. These masks were well priced! 8 masks per pack for under W4,000. I wanted to pick up a snail slime mask to see what all the hype was about, but the line was insanely long and we were running out of time. Michael got a full length Stitch onesie. I want to take a picture of him whenever he finally wears it, but it's been too hot the past few nights. We stayed out until midnight and got home right before 1 AM. From there I video called my parents to show them some of the stuff I got, then played a little Ark before turning in for the night. The rest of my weekend has been spent sleeping, playing Ark, or catching up on all the cleaning I neglected this week. Somehow our dishes managed to multiply exponentially. Michael has mentioned that I should start watermarking all of my pictures. I guess I can see that, but I know it will add a lot of time to my more picture heavy posts, which can be a bit of a bummer if I want to quickly create a post. Tomorrow we have tentative plans to go to the aquarium. We'll see how those plans actually pan out. 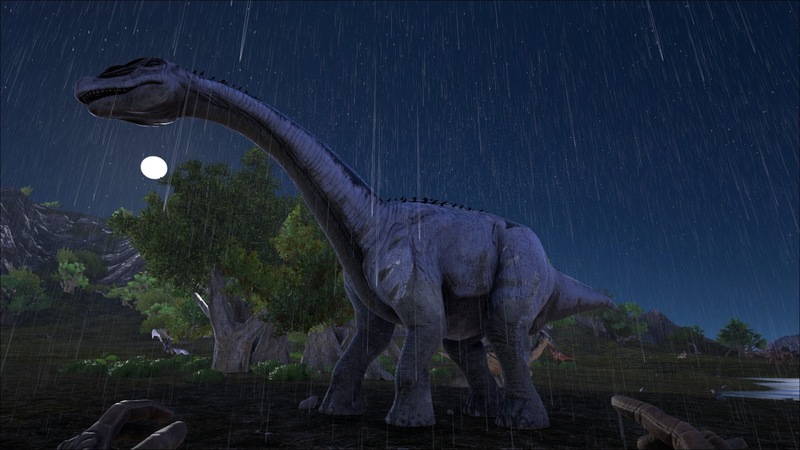 As for me, I'm most likely going to play some more Ark before turning in early for the night.